Henshaw, James W., head-of-household, age 28, born in Texas; father born in Alabama; mother born in Texas; first marriage, married 10 years; occupation: farmer, general farm; owned farm (free). Henshaw, Mary F., wife, age 27, born in Arkansas; parents born in Tennessee; first marriage, married 10 years; 4 children, 4 living. Henshaw, Dewey [unclear] Lee, son, age 9, born in Texas; father born in Texas; mother born in Arkansas; attended school. Henshaw, George H., son, age 3, born in Texas; father born in Texas; mother born in Arkansas. Henshaw, Edward, son, age 2, born in Texas; father born in Texas; mother born in Arkansas. Henshaw, Lonnie, son, age 5 months, born in Texas; father born in Texas; mother born in Arkansas. Henshaw, Jas W, head-of-household, age 37, born in Texas; father born in Alabama; mother born in Texas; occupation: farmer. Henshaw, Frona [unclear] M., wife, age 37, born in Arkansas; parents born in Tennessee. Henshaw, George H., son, age 13, born in Texas; father born in Texas; mother born in Arkansas; attended school; occupation: farm worker, at home. Henshaw, Edward B., son, age 11, born in Texas; father born in Texas; mother born in Arkansas; attended school; occupation: farm worker, at home. Henshaw, Lennie H., son, age 10, born in Texas; father born in Texas; mother born in Arkansas; attended school. Henshaw, Milford F., son, age 8, born in Texas; father born in Texas; mother born in Arkansas; attended school. Henshaw, John [unclear] M., son, age 7, born in Texas; father born in Texas; mother born in Arkansas; attended school. Henshaw, Jess [unclear] O., son, age 5, born in Texas; father born in Texas; mother born in Arkansas. Henshaw, R. C., son, age 3 years 6 months, born in Texas; father born in Texas; mother born in Arkansas. Henshaw, Carl M., son, age 1 year 10 months, born in Texas; father born in Texas; mother born in Arkansas. Henshaw, unnamed, son, age ? months [unclear], born in Texas; father born in Texas; mother born in Arkansas. Henshaw, James W, head-of-household, age 47, born in Arkansas; parents born in Tennessee; first married at age 23; owned home; no radio in home; occupation: farmer, general farming; not a veteran. Henshaw, M. Froni, wife, age 44 [unclear], born in Texas; father born in Texas; mother born in Arkansas; first married at age 22. Henshaw, Lonnie H., son, age 20, born in Texas; father born in Texas; mother born in Arkansas. Henshaw, Meford F., son, age 19, born in Texas; father born in Texas; mother born in Arkansas. Henshaw, Malvin R., son, age 17, born in Texas; father born in Texas; mother born in Arkansas; attended school. Henshaw, James O., son, age 15, born in Texas; father born in Texas; mother born in Arkansas; attended school. Henshaw, R. C., son, age 13, born in Texas; father born in Texas; mother born in Arkansas; attended school. Henshaw, Carl M., son, age 11, born in Texas; father born in Texas; mother born in Arkansas; attended school. Henshaw, Homer S., son, age 10, born in Texas; father born in Texas; mother born in Arkansas; attended school. Henshaw, Othello R., son, age 8, born in Texas; father born in Texas; mother born in Arkansas; attended school. Henshaw, Arthur J., son, age 5, born in Texas; father born in Texas; mother born in Arkansas. Henshaw, Wallice, son, age 2, born in Texas; father born in Texas; mother born in Arkansas. Henshaw, J. W, head-of-household, age 57, born in Texas; completed 6th grade; on Apr 1 1935 was living in the same house; rented farm ($8/month rent); occupation: farmer, farm. Henshaw, Fronie, wife, age 57, born in Texas; completed 6th grade; on Apr 1 1935 was living in the same house. Henshaw, Marvin, son, age 27, born in Texas; completed 2 years of high school; on Apr 1 1935 was living in the same house; occupation: farmer, farm. Henshaw, R.C., son, age 23, born in Texas; completed 3 years of high school; on Apr 1 1935 was living in the same house; occupation: farmer, farm. Henshaw, Sam, son, age 20, born in Texas; completed 4 years of high school; on Apr 1 1935 was living in the same house; occupation: farmer, farm. Henshaw, Otis, son, age 18, born in Texas; completed 3 years of high school; on Apr 1 1935 was living in the same house. Henshaw, Archie, son, age 15, born in Texas; completed 1 year of high school; on Apr 1 1935 was living in the same house; attended school. Henshaw, Wallice, son, age 11, born in Texas; completed 6th grade; on Apr 1 1935 was living in the same house; attended school. J.W. Henshaw, 71, retired farmer and longtime resident of Haskell County, died in the Haskell Hospital at noon Thursday, Dec. 3. He had been in ill health for three years and entered the hospital about 5 weeks ago due to a heart ailment. Funeral services were held at 2:30 p.m. Friday at the First Baptist Church, with the Rev. J.M. Edge, pastor of the Central Baptist Church, and the Rev. Sid Davis, assistant pastor of the First Baptist Church, officiating. Burial was in Willow Cemetery under the direction of Holden Funeral Home. Mr. Henshaw was born June 20, 1882 in Bell County, the son of the late Mr. and Mrs. G. W. Henshaw. The family came to Haskell County from Bell County in 1906. Mr. Henshaw was married July 5, 1905 to Mrs. Mary Rainwater Speer, also of Bell County. Survivors include his wife; one step-son, Jack Speer of Haskell; 11 sons, G.H. Henshaw of Abilene, E.B., C.M., H.S. and Wallace J. Henshaw, all of Ft. Worth; L.H. Henshaw of Kermit, M.F., J.O. and O.H. Henshaw, all of Haskell; R.C. Henshaw of Tulsa, Okla., and A. A. Henshaw of Medicine Bow, Wyo. ; 19 grandchildren and three great-grandchildren; seven sisters, Mrs. Ida Ford of Abernathy, Mrs. J.A. Rose of Rochester, Mrs. H.G. Scott, Mrs. G.W. Piland and Mrs. C.C. Rose, all of Haskell, Mrs. R.W. Spinks of Stafford, Arizona, and Mrs. E.L. Phillips of Amarillo. One son, Lt. J.M. Henshaw was a casualty in World War II. 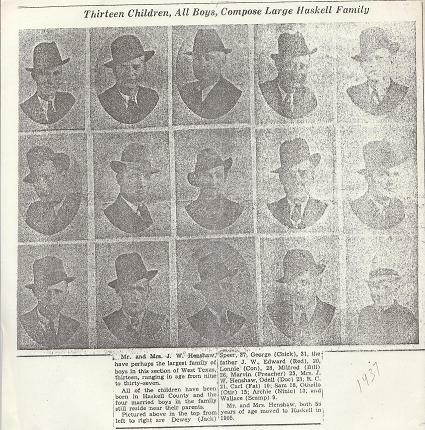 Eight of Mr. Henshaw's sons were in the service during the war. Pallbearers were Bob Herren, Buford Cox, Henry Atchison, Rice Alvis, Trav Everett, Bob Sego, T.E. Lusk, and Bill Pennington. Obituary of J.W. Henshaw, contributed by Colleen (Scott) Young (). 1910 census, Haskell, Haskell County, Texas; roll T624-1562, ED 108, page 12B, line #56, dwelling #166, family #166. 1930 census, Precinct 1, Haskell County, Texas; roll T626-2354, ED 3, page 4B, line #64, dwelling #73, family #79. Obituary of Homer Samuel Henshaw. Contribution from Neta Roberts ().